Benton-Lane Winery was founded by lifelong winemakers Steve and Carol Girard. It was a love of silky, spicy Oregon Pinot that precipitated their move from Napa to the Willamette, where they planted vines on a historic sheep ranch. Steve and Carol purchased the property (which straddles Benton and Lane counties) in 1988 and Pinot planting commenced the next year. Steve and Carol’s first Benton Lane wine was produced in 1991 (it was largely consumed by lucky friends and family). Benton Lane’s first vintage was 1992; in the early days, winemaking and cellaring took place at neighbouring wineries while the Girard’s facility was painstakingly constructed. At the time, there were few Pinot Noir producers in the area. 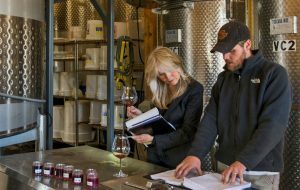 Because of the long, sunny days, high diurnal shift, soil, and climate, Carol and Steve saw the perfect opportunity to craft exceptional Pinot Noir. From the beginning, vines were tended sustainably with an eye to drawing out terroir, as is often the case for those enamoured by Pinot. Alongside their lush, expressive Pinot Noir, the Girards produce fruity, crisp Pinot Gris; deep, aromatic Pinot Blanc; and rich, velvety Chardonnay. 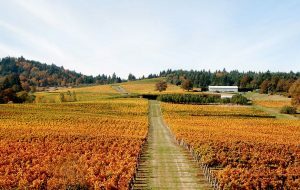 Over the years, the vineyard has grown to 142 acres of Pinot Noir, Pinot Blanc, and Chardonnay. All wines continue to be made entirely of estate-grown grapes grown according to the Girard’s painstakingly intensive principles. Walk around the property and the holistic approach becomes clear: organic material from the vineyard and staff kitchen garden are composted and returned to the vines as rich humus, cover crops of crimson clover and winter peas mown by sheep reduce erosion and build the soil, perches built in trees surrounding the vineyard encourage hawks to roost and help keep pests down. These practices, which thoughtfully draw from biodynamic and organic technique, are the edge that makes Benton Lane wines exceptional. Today, Benton Lane wines have received more “Top 100 Wines of the Year” than any other still wine producer in Oregon. They were named one of Oregon’s “Best Producers” by Decanter Magazine as early as 2008.